The doll maker Lucy Peck ran a highly successful retail business called The Dolls' Home, which opened in Regent Street in London in 1893. The shop sold novelties and toys as well as dolls. The Lucy Peck mark on a doll does not necessarily indicate that she created it, because she sold other makers' products in her shop and also repaired dolls. 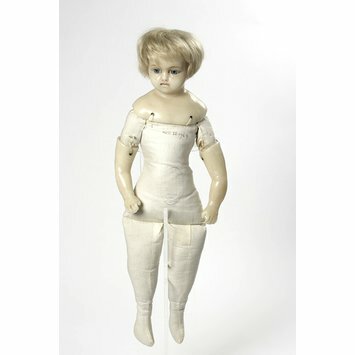 This doll not only carries the Lucy Peck mark but also has the firmness of expression which she often gave to her baby and toddler dolls, in contrast with contemporary sentimental imagery. 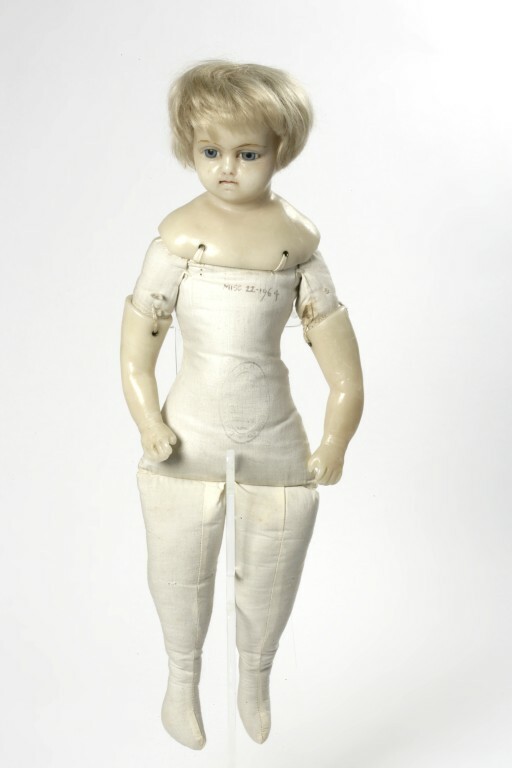 Doll representing a young Caucasian child, with a poured wax shoulder head, lower arms and hands of poured wax, on a calico body, straight legs and feet; the hands have the thumbs free and the fingers marked. The doll has short smooth blonde hair inserted with knife cuts, and fixed eyes of white and blue glass which look downward and to its right beneath brown eyebrows. The closed mouth has red painted lips, and each nostril has a red dot. The wax arms are attached with white cords and the shoulder head with white cotton tapes, the holes for the fastenings being reinforced with metal eyelets. Mrs Peck's stamp on the body, although now much faded and virtually impossible to read, is recorded at the time of acquisition (21/08/1964) as "Body stamped with mark of Mrs Lucy Peck, The Dolls' Home, 131, Regent Street, W". As the lease on these premises expired in 1908 and Mrs Peck re-opened at 215 High Street Kensington, it suggests that the doll dates from 1908 or earlier. It is highly unlikely that the curators in 1964 would have known Mrs Peck's address from any other source than the doll's body.